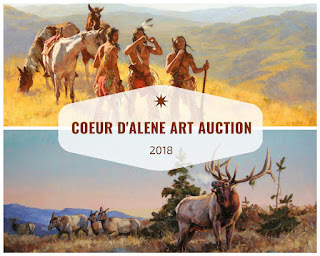 Western Art Collector wrote such a nice article about the inaugural "Wonders of Wildlife" Show, that I thought I would share it with you here. The article is written by Western Art Collector and is featured in their June 2011 issue. Western Art Collector is a terrific magazine and if you enjoy collecting Western Art, then a subscription is a must. I recommend you visit their site: Western Art Collector. Their publication will keep you up to date on upcoming gallery exhibitions, auction results, and major museum events around the country. I know most galleries host their wildlife shows in the fall which coincides with hunting season and the big game is on the mind. However, the incredible wildlife of North America is around us all year, and during the summer is probably when we may encounter some wildlife as we fish, hike and camp through the summer. 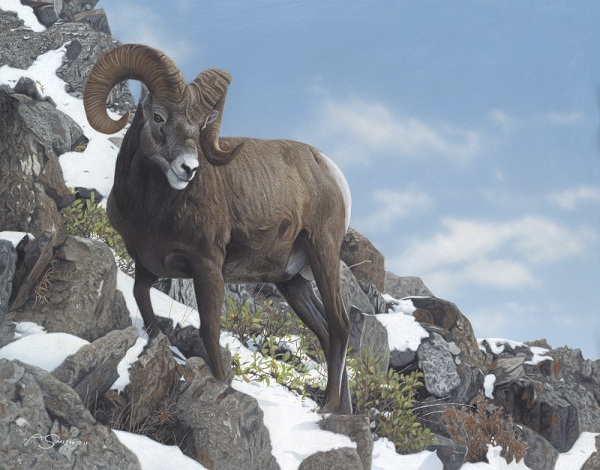 Coeur d'Alene Galleries has always been a leader in supporting Wildlife art, and now the gallery is hosting an exhibition featuring 8 of today's brightest Wildlife artists. Participating artists include Brian Grimm, Terry Isaac, Julie Jeppsen, Joe Kronenberg, Chad Poppleton, Tim Shinabarger, Ryan Skidmore, and Adam Smith. You can view all the works available by clicking here: Wonders of Wildlife. The opening reception is Friday, June 10th at the gallery from 5-8pm. I hope to see you there for a glass of wine and some dramatic Wildlife art! Now, enjoy the article by Western Art Collector. 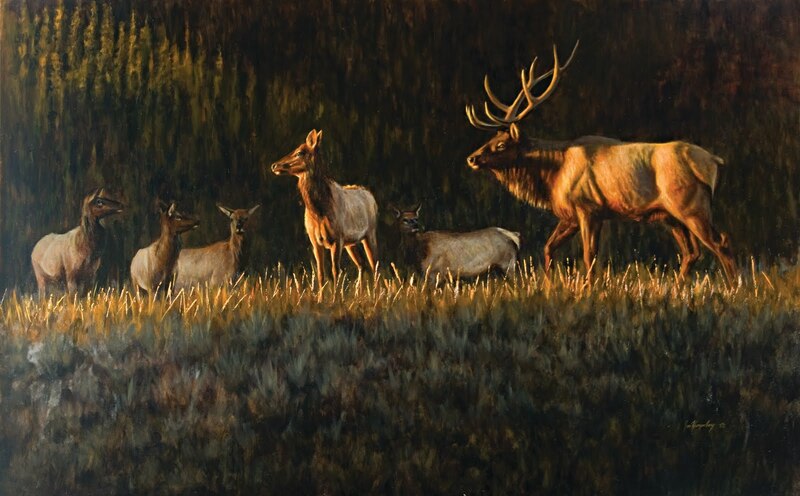 Coeur d'Alene Galleries continues its peak season with Wonders of Wildlife featuring eight of today's top artists working in the popular genre. Participants include Brian Grimm, Terry Isaac, Julie Jeppsen, Joe Kronenberg, Chad Poppleton, Tim Shinabarger, Ryan Skidmore and Adam Smith. 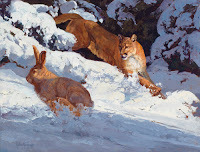 "The Wonders of Wildlife show is a unique exhibition of the country's premier wildlife artists," says gallery owner Buddy Le. 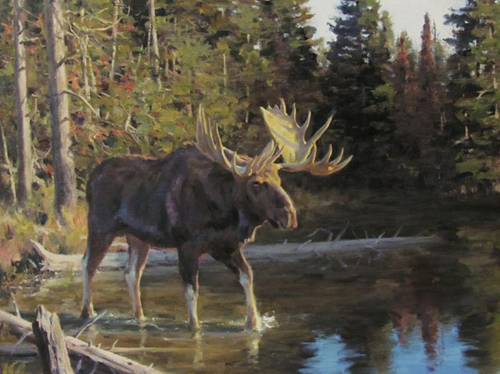 "This collection of wildlife artists are not only committed to their craft, they have an intimate knowledge of their subject matter that is exposed in their work." Adam Smith enjoys viewing the subjects he paints in their natural habitat. Preferring acrylics, he always challenges himself with new ways to paint his habitat and subjects. The perspective of the ram against the sky in his new piece At The Skyline captured his attention. 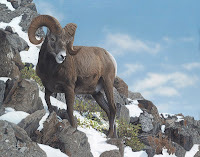 "Big horn sheep live in some of the harshest conditions in North America. It is incredible the type of terrain they can cross. I remember losing my footing several times photographing these sheep, while they had no problems at all," says Smith. Terry Isaac also draws his inspiration from observing nature, always in search of "magical moments." His new piece At Water's Edge captures a cougar dispelling the notion that cats are afraid of water. "Cougars are actually excellent swimmers," says Isaac. "I enjoyed painting this piece in a more extreme vertical format with the interesting abstract patterns of the cougar's reflection displayed in the water." 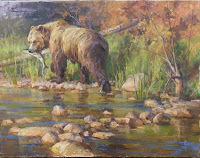 Utah artist Chad Poppleton pays tribute to water-the lifeblood that feeds the land-in his new painting The River's Gift. The scene was inspired from an early autumn along a riverbank. "All living organisms rely on the life-giving sustenance that water gives. Grizzlies are no exception to the dependency from this lifeblood," says Poppleton. "The pattern of color from the complements of the green grass against the red, orange and yellows of the foliage to the reflected water below also inspired me." Joe Kronenberg's new oil painting Mountain Meadow Morning uses light to tell a simple story. He came upon this scene while looking for a good bull elk to photograph in Yellowstone last September. "Seeing a couple cows, I pulled off the road to get closer. As I approached I could see the tips of antler on the other side of the hill moving my direction. It could not have been more perfect," recalls Kronenberg, "...as he crested the hill along with one of the cows, they turned into the sun just as it came up, blasting them in an orange glow of light." Article written and attributed to Western Art Collector. 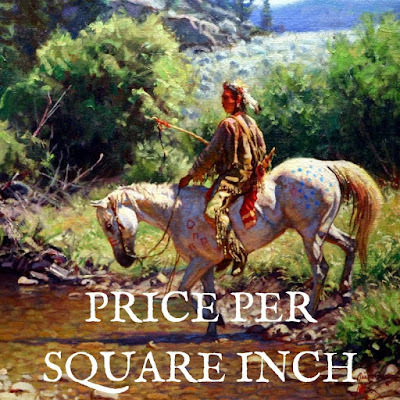 Should You Use Price-Per-Square Inch to Price Paintings?